If you’re a card-carrying member of #BeardGang, chances are you already know about Scotch Porter—and if you don’t, you should. The Northern New Jersey-based brand has developed a cult-like following since its launch three years ago, initially on the strength of its all-natural, high-end beard-care products, which have changed the grooming game for tens of thousands of men. In the years since, the brand has expanded to include hair and skin products, and last fall launched “Fresh Meat,” a masculine wipe for much-needed care “down there,” which was accompanied by an absolutely ingenious promotional spot. We have constant dialogue with our customers in terms of product development—what they’re looking for, what they’re interested in, what they think is missing—and for the last year-and-a-half, we have consistently heard body care ... And so, we’ve finally put together a collection that [will] answer what they’ve been asking for. The new Mineral Enriched Body Collection, which launches Tuesday evening with a fitness event in New York City, includes a botanically-enriched body bar, exfoliating body scrub, body wash and hydro-defense body lotion. All are made without sulfates and are based on a fermented bioactive mineral complex, including skin-building minerals like zinc, copper, silicon, iron and magnesium—and all are offered within the very reasonable price range of $14-$20. And while they’re made for men, Quallis confides that the products are still strong (and safe) enough for women (*wink*)—though many of the women Quallis has consulted with can’t wait to get it on the bodies of their baes. Quallis is a former design and marketing exec whose inspiration for Scotch Porter initially drew upon his childhood experiences in his mother’s beauty and barber shop, where he witnessed firsthand the transformative power of grooming. Unfulfilled by his corporate career path, it was nostalgia that inspired Quallis to open his own five-chair barber shop in his native Newark, N.J., where he quickly noticed many of his clientele suffering from the same dry hair and skin issues. Doing his own research to find a solution, Quallis developed a line of products for his barbers, using the shop as a testing ground as he refined his formulas. The results were so successful that customers began traveling from neighboring states to purchase, forcing Quallis to start selling online out of sheer necessity. Drawing on the names of his favorite liquor (Scotch) and favorite jazz singer (Gregory Porter), Scotch Porter was born. 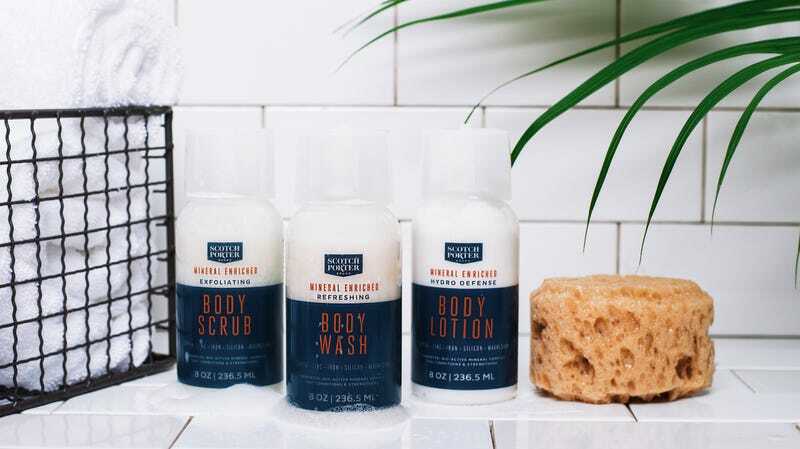 Such was the demand for a high-quality men’s grooming line that in the first year of online selling, Scotch Porter organically grew from a kitchen-born business to a million dollars in sales. The barber shop no longer exists, but the business has continued to grow about 200 percent compounded annually; Quallis now employs a full-time team of eight and works in tandem with several agencies and boutique retailers to bring Scotch Porter to the masses. While the line has a multiethnic following, the level of care the brand offers was formulated with the specific needs of black men in mind (e.g. extra moisture). With the launch of the body care line, which will be available exclusively on the Scotch Porter website, the brand will now be a one-stop shop for the head-to-toe grooming needs of its clientele, whom Quallis encourages to pamper themselves. Plenty of men think that skincare is only needed when you have specific skin issues, or for problems like acne, dark marks, wrinkles [or] redness. However, I feel very strongly that a really good daily skincare routine helps to prevent most of these issues in the first place. Our bodies and skin deserve products that leave it feeling exfoliated, moisturized and fresh—every day. The Glow Up tip: Are you a New York City area resident who wants to experience Scotch Porter’s latest launch firsthand? Join the brand for a “sweat and get fresh” Workout session—including product giveaways—on Tuesday, July 24 at 7 p.m. sharp EDT at 9 West 8th Street. RSVP at scotchporterRSVP@gmail.com.